"It looked and felt genuine in a day and age where it's easy for performers to simply phone it in." Swedish phenom Ghost have been chosen to curtain jerk Metallica's 25-date European stadium tour next year. The Devilish, theatrical act have been on the road all year promoting their newest album, 'Prequelle', and record breaking single "Rats", which has earned an impressive 9-week run as #1 song on Active Rock Radio. After Revolver's "Rats! Across America" trek through North America this past spring, Ghost finishes up their busy year with "A Pale Tour Named Death" stretch of 40-tour dates, which happened to include one of Maximum Metal's home cities--Jacksonville, FL. The ticket said 8:00 PM. In one of the oddest events to happen in my 25+ years of heavy metal shows--the show began at exactly 8:00 PM. Immediately, my sub-par enjoyment of the band's back catalog was erased. 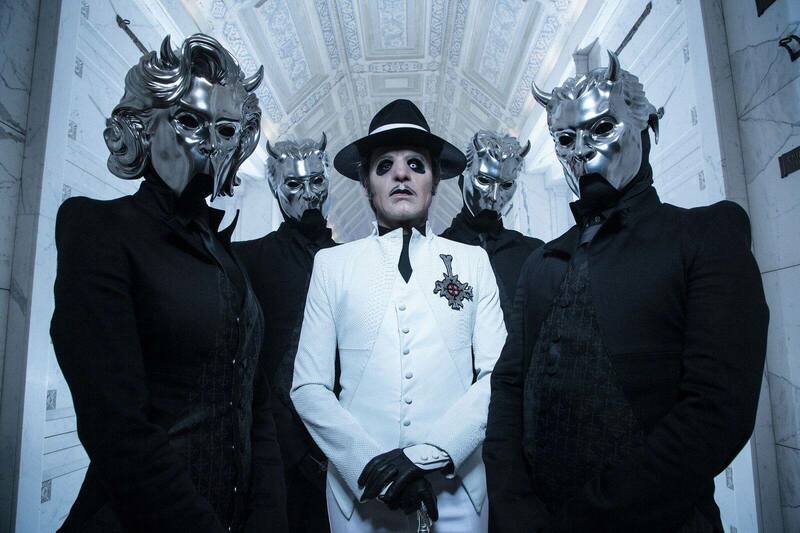 Ghost were both punctual and professional. With the lights out, the band's introduction began with "Ring a ring of roses" from "Prequelle's opening track "Ashes". The 1:30 intro launched into monster hit "Rats" and the show was on. Cardinal Copia (band creator Tobias Forge's character) was the highlight of the show, running through a number of characters, wardrobes and even accents/persona. With seven band members (clandestine Ghouls and Ghoulettes) and a penchant for 70s harmonies and theater, the atmosphere was a macabre cabaret of Goblin/John Carpenter/Blue Oyster Cult that Copia utilized without sacrificing validity. It looked and felt genuine in a day and age where it's easy for performers to simply phone it in. With two acts and a 15-min intervention, the 2-hour show featured 26 songs and a variety of performances. At one point the band's prior singer, Papa Nihil (really just Tobias or another member in costume) came out with guards and played a saxophone solo (although I'd speculate it was a backing tape). Copia slipped into his Italian club-owner facade to talk with the crowd about dirty song lyrics. With the Ghouls unplugged, the group performed "Jigolo Har Megiddo" before softening the first act's finale with "Pro Memoria", "Witch Image" and "Life Eternal". The second act began with 'Meliora' highlights "Spirit", "From the Pinnacle to the Pit" and "Majesty". Copia, dressed in King Diamond attire (or is it X-Men villain Sinister? ), led the band into bewitching cuts like "Faith", "Year Zero" and fan favorite "Square Hammer". The second act was equally as entertaining as the first--albeit looser as the fans were fully saturated for the second hour. With plenty of "Hail Satans" and nonsensical lyrical fodder about "Father Lucifer" aside, the show still provided a compelling, thrilling evening of entertainment that demands to be seen again. As a historical Ghost skeptic, my next spectator gig will be in the choir.